$12.231 million on 2527 screens. 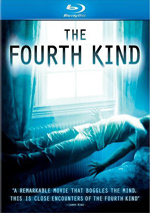 Though the title of 2009’s The Fourth Kind reminds us of Steven Spielberg’s 1977 classic Close Encounters of the Third Kind, it takes a much more pseudo-documentary approach to its alien subject matter. Set in Alaska circa early October 2000, the film focuses on psychologist Dr. Abigail Tyler (Milla Jovovich). She goes into therapy for herself after the brutal murder of her husband Will. Abigail devotes herself to the completion of a study important to Will. Some Nome residents would awaken suddenly in the middle of the night and claim to see white owls staring at them through their windows. Matters intensify along the way, and eventually events connect to Abigail’s own life as she suspects a connection between these weird memories and her husband’s death. As I noted at the start, Kind goes with an unusual filmmaking style. It combines “actual” video/audio recordings of the film’s subjects with reenacted pieces from actors. The latter side of things heavily dominates; while we find quite a few of the “archival” bits, most of the movie features the professional actors. I put “actual” and “archival” in quotes because nothing here really happened. Kind uses facts as its loose inspiration, as it relates to semi-mysterious missing persons cases some speculate relate to alien abductions. That’s as close to fact as the film comes, though. No “Dr. Abigail Tyler” exists, and all of the “archival material” found here was created just for the film. I’ll give Kind points for creativity, at least. Most flicks of this sort take the same path as Paranormal Activity: they include nothing more than raw footage allegedly shot by the characters. The use of the reenactments allows Kind to go down two paths. It presents a more professional film experience that can benefit from the usual cinematic techniques while it also gets the verisimilitude of the “historical material”. This approach isn’t unusual for documentaries or programs like America’s Most Wanted, of course, but it’s something different in the world of big-screen fiction. Not that the filmmakers want you to know that the events in Kind never actually happened. Like Paranormal, nothing in Kind tips its fictitious hand. You’ll find no credits for the actors who perform the “archival footage”, and the flick even lacks the usual disclaimer about how it wasn’t based on real people/events. While Kind goes with a novel approach, that doesn’t make its style effective. If anything, I think the two techniques cancel out each other. The professional material undercuts the potential power of the “real” footage, while the latter creates a distraction when it appears, as the two just don’t blend well. Some of that stems from the film’s gimmicky techniques. It often splits into two – or even four – blocks to show “archival” and “reenacted” material at the same time. Though this intends to add realism, it doesn’t succeed. Instead, it comes across like a goofy sideshow. Either go with “real footage” or “reenacted footage”; the combination of the two doesn’t work. It doesn’t help that the filmmakers prefer an extremely aggressive attack on the story. Though I thought Paranormal was a snoozefest, I did appreciate its subtlety, as it tried hard to play as real found footage. Kind, on the other hand, works overtime to throw every loud, in-your-face technique at us. The movie almost never slows down and takes a breath. Instead, everything’s super-urgent, as the pushy score, exaggerated effects and zippy visuals do what they can to make us scared and tense. These do give us a few cheap jolts, but we never really feel invested in the story or characters. Some of that comes from the film’s awkward combination of standard cinema and “documentary” elements, but a lot of the problem stems from the over the top use of audio and visual gimmicks. When a movie always shoots for “11” on the amplifier, little affects us. Somewhere down deep, a good movie could’ve been made from this material. At the very least, I suspect that if Fourth Kind had committed to either of its stylistic choices, it would’ve been more satisfying. As it stands, the movie tries too hard to scare us and it flops. The Fourth Kind appears in an aspect ratio of approximately 2.35:1 on this Blu-ray Disc. Despite some intentionally amateurish footage, Kind looked great. The fake archival material was the only weak link, and I certainly couldn’t fault the transfer for those unappealing moments. Besides, most of the movie used professional shots, and those were excellent. Sharpness always appeared concise and well-defined, as they displayed no signs of softness. These shots lacked jagged edges or shimmering, and the movie displayed no signs of edge haloes. Source flaws also remained absent. Given the movie’s chilly setting and its supernatural focus, it came with a subdued palette. Cold blues dominated the film, though some other quiet earthy tones appeared. These looked well-represented and accurate. Blacks were tight and deep, while shadows appeared concise and smooth. I felt quite pleased with this excellent visual presentation. The DTS-HD MA 5.1 soundtrack of Fourth Kind also satisfied. Its most powerful material stemmed from the memories of the victims. Those used various effects to create excitement and involve us in the psychological action. The track also played music from all around the spectrum. Rather than sound showy, this made the score more involving and more effectively “supernatural”. Some directional dialogue added to the impact at times and helped make this a broad, engulfing soundfield. At all times, audio quality pleased. Speech occasionally got a little buried in the mix, but the lines still remained concise and intelligible. Music displayed nice range and clarity, and effects were strong. They appeared lively and potent, with good accuracy and punch. All in all, I felt very happy with this positive presentation. Almost no extras show up here. We find eight Deleted Scenes that run a total of 23 minutes, 12 seconds. The first shows more “archival footage”, but it has the odd effect in that it proves that the “real” material was faked; it presents speech from the setting but no other audio since the gunshots and other elements were added later. As for the others, they tend to add small character moments. In particular, we get more of Abigail and her kids. We also find more from Abigail’s colleague Dr. Campos and brief extensions to existing scenes. I can’t say anything memorable occurs in any of these sequences. If nothing else, The Fourth Kind gets some points for its unusual approach to its subject matter. Unfortunately, it earns fewer points for effectiveness, as the different styles actually tend to undercut the material and make it less involving. The Blu-ray offers excellent visuals and very good audio but skimps on supplements. The disc boasts a strong presentation of a lackluster movie.